The State University of New York at New Paltz tennis team collected its fourth-straight 9-0 sweep Sunday to finish the regular season a perfect 7-0 with its victory over The College at Brockport. 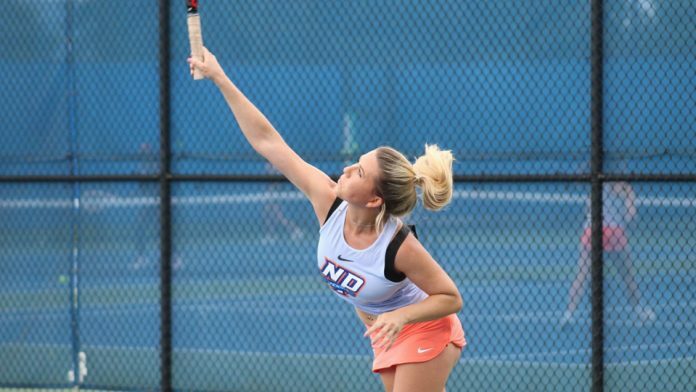 BINGHAMTON — The State University of New York at New Paltz tennis team collected its fourth-straight 9-0 sweep Sunday to finish the regular season a perfect 7-0 with its victory over The College at Brockport. SUNY New Paltz (7-0 overall, 7-0 conference) had already clinched the top seed in the State University of New York Conference (SUNYAC) tournament next weekend, the first time doing so since 2006, but the win also gave the Hawks their first undefeated conference record since 2012. Through their seven games, they’ve lost just four matches and earned six shut out victories. Against the Golden Eagles (2-10, 0-6) Sunday, SUNY New Paltz started the outing with an 8-0 win in first doubles by Trinity Chow and Laura Koob. Second doubles pair Victoria Zezula and Lindsay Haley won, 8-2 and Alex Chimenti and Ava Sweeney earned an 8-1 win in third doubles. Chow and Koob each swept the opposition, 6-0, 6-0 in first and second singles, respectively, while Courtney Koran defeated Zoe Sharp, 6-1, 6-1 in third singles. Maddy Bourne then earned a 6-2, 6-0 victory in fourth singles over Jen Kelly, while Haley won in fifth singles and Cielle Pappalardo defeated Pheobe Morse, 7-5, 6-2, in sixth singles. The Hawks’ SUNYAC championship run starts Oct. 13 at Binghamton Racquet Club against No. 4 seed Fredonia State. The winner of that game will face off against the winner of either SUNY Oneonta or SUNY Geneseo Sunday.